With the exception of a few updates along the way, our vintage Wisconsin Northwoods Lodge has stood in the same spot since the late 1940’s. 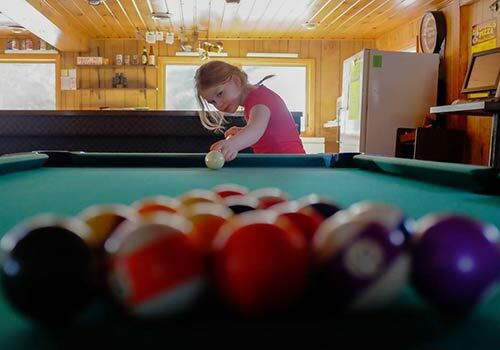 With all the charm of a northern Wisconsin resort – complete with aged pine ceilings and creaky floors – the Lodge remains the center of the action for the entire resort! There is always something happening at Top O’ the Morn Resort. 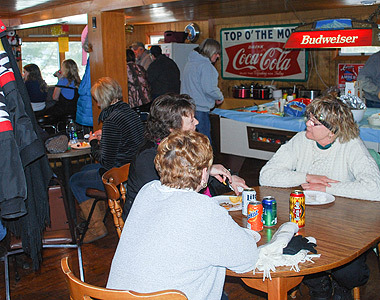 From fishing contests to potlucks, kids’ games to scheduled events, it all starts at the Lodge. The Lodge is also the best spot in the campground for WiFi access and a convenient spot to check in with the digital world. Like many off-the-beaten-path destinations, cell reception can be spotty for some carriers at the resort. But you can always charge your wireless device and use free WiFi at the Lodge to stay connected. 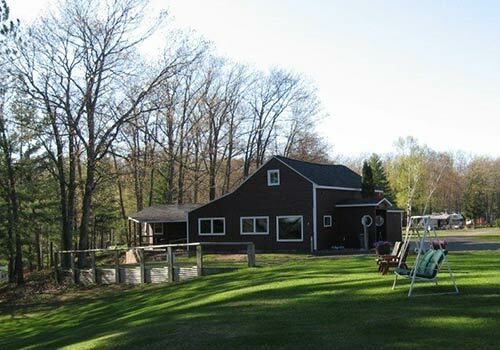 The Lodge is open daily and offers a variety of amenities to add to your vacation enjoyment. Numerous items are available for purchase including: T-shirts, sweatshirts, hats, 5 lb. bags of ice, Heggie’s pizza, pizza fries, popcorn, candy, ice cream, pop, beer, and live bait (worms, crawlers, and leeches) just to name a few! We welcome you to join us in the Lodge for our Friday night pizza special from 4:00 p.m. – 10:00 p.m. and Happy Hour on Saturday from 4:00 p.m. – 6:00 p.m.
Restrooms and showers are accessible 24/7 from the backside of the Lodge. Coin-operated showers are available both inside and outside (individual shower stalls). The cost is $0.25 for 2 minutes with a 14-minute maximum. The Laundry Room is open daily in the Lodge from 9:00 a.m. – 9:00 p.m., and the cost is $1.75 per wash and $1.50 per dry. During the summer months, we have organized activities and games for the kids every Saturday afternoon – rain or shine. It might be a hula hoop contest, a game of basketball, board and card game tournaments, a scavenger hunt, or when the sun is really scorching...water games! Games are open to anyone visiting or staying at the resort, so send the kids down and enjoy a little quiet time. Thinking about a canoe trip down the Brule? Or maybe a guided fishing trip on a nearby lake? Restaurant recommendations? Even if you don’t want to leave the resort, we might be having an evening soft toss tournament, a pig roast, or even a catered dinner overlooking the lake. Stop by the Lodge to see what’s happening here, there, and anywhere in between. The Lodge has some of the best frozen pizzas around. We have weekend specials, beer and pizza specials, Badger game specials, and ‘just because’ specials. And if you haven’t tried our pizza fries, we will warn you in advance...they are addicting! 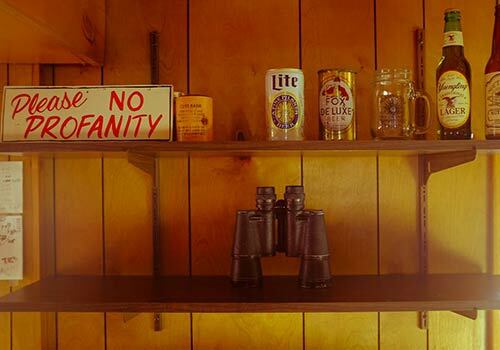 For those looking for a refreshing beverage, the Lodge prides itself on a unique and diverse selection of craft beers. At any given time, we typically have 40 or more beer choices on hand. Since we have guests from all over country, we like to showcase what our region has to offer. And let’s face it, Wisconsin knows how to brew beer! The majority of our beers are brewed on a local, regional, or state level – and many have limited distribution outside of the state.